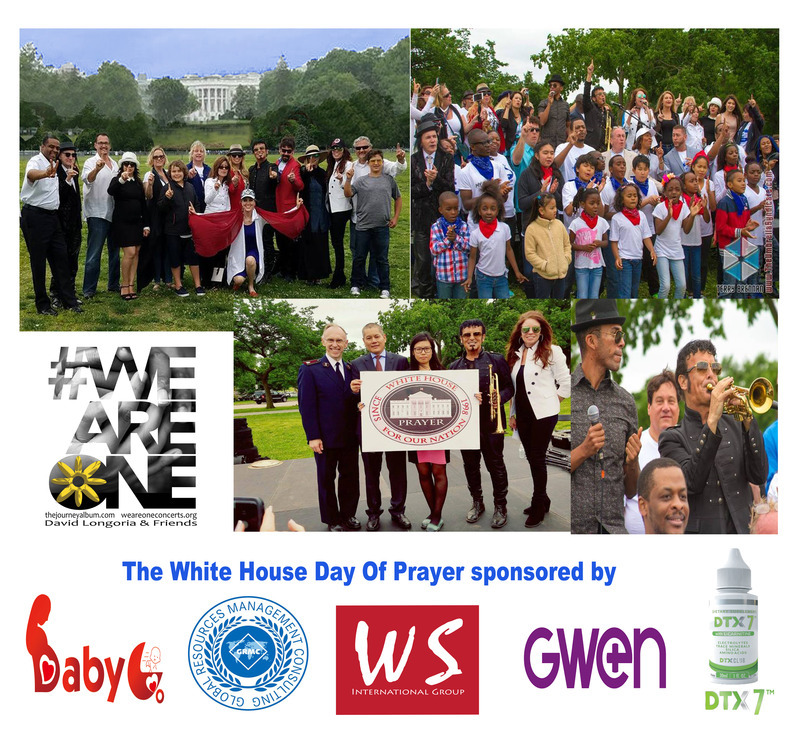 WASHINGTON DC Sponsors from China and the USA combined efforts to launch a new song and movement of unity "We Are One" at the 19th Annual White House Day Of Prayer on May 20th on The Lawn of The White House. WS International Group, Baby Go, Global Resources Management Consulting Group from China and USA based supplement product DTX 7 all brought their brands and delegates to participate in the event supporting unity of all people. Michael Deliz brought his 12 year old son, Michael from their home in Orange County, California to attend the iconic event. "I wanted my son to see firsthand this moment in history as we bring the song and movement to the nation's first address," he says, adding "We feel like this has been an amazing experience and we are glad to bring our company and our product to the event in support." Deliz' company markets a nutritional supplement called DTX7 which is available from the company's website (dtx7rocks.com) but was not sold on the lawn. Singer and trumpetist David Longoria brought his song to the outdoor event because of this year's theme of unity. "When Reverend Terry Lee of Brooklyn called and asked me to bring my music to the White House lawn, I didn't hesitate as I knew it was the perfect place and time to launch our iconic song 'We Are One' in support of one another,' Longoria explains, adding "We feel so much appreciation to these fine companies from both China and the US for their support and participation this year, here on President's park of the White House lawn." Longoria was joined by a choir consisting of many singers and artists from coast to coast and many who sang on the recorded song as well. Western Territory Leader of International service organization The Salvation Army, Commissioner Ken Hodder addressed the live audience on stage. "I am honored to be here with you on the White House lawn to support prayer for our nation and leaders," he said from the stage. Longoria also addressed the crowd during the all day event saying "we are so blessed to be welcoming participants from as far away and China and across the US and Africa who made the trip to support unity and acceptance of one another." The attendance of companies' delegates participating from around the globe was not overlooked by the audience. "I met pastors from Africa and a business lady who just flew here from China," exclaimed 15 year old Baltimore resident Lisa Lemming who was there with her family. "I was excited to see so many people who wanted to share support for each other," she added before she sang with the choir on stage. Kelly Gu and Jack Gu attended as representatives from Chinese/American import/export and consulting companies. Their brand Baby Go specializes in exporting American baby products for the Chinese market. And their brand Global Resources Management Consulting helps facilitate trade between China and the US. "We are glad to have such valued sponsors on board for the launching of �We Are One' across America, from China and the US", Longoria says, adding "to bring trade and good will together in this event encouraging each other is symbolic and powerful"
Founder of GWEN, the Global Women's Empowerment Network, Tess Cacciatore brought her voice to the event. Her Los Angeles based multi media network is launching this fall with entertainment and cause driven programs for peace and unity. "The event and theme of unity hits home for me as we are building a brand around the idea of empowering and supporting one another," she explains, adding "I feel the energy of all the voices singing with mine today for support and encouragement." The official launch of the song of unity on the lawn of The White house has a significant meaning to it's founder. "By bringing all these people together to encourage and declare unity between all people here in America starting at The White House means we are bringing this message all over the country and then all over the world," Longoria says, adding "Bringing on board our sponsoring companies from both The US and China shows how well we can work together for the good of all people, and we are doing it starting today."